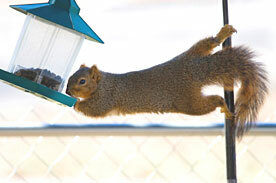 The squirrels at my birdfeeder must be the most well-fed in our entire town. Fed a steady diet of sunflower hearts, I have visions of them sitting in the trees late in the evening, lighting a cigar and boasting what gastronomic feasts were enjoyed at the Harpers today! But they do have to work for it. They spend hours each day on the grass inspecting the feeder. They attempt to climb the feeder from the ground hundreds of times during the day, apparently thinking that one of those times the baffle will turn itself upside down and actually help them up the pole. And then finally they go up a tree that’s next to the garage and jump, quite literally, a full 20 feet to the feeder, bang into the pole and somehow manage to hang on. The squirrels in my yard are, along with being well-fed, persistent. Actually, they are well-fed because they are persistent! Who Said Persistence is Passe? Times have changed since Julie and I worked together. Now many of the popular sales methodologies taught do not incorporate persistence into their curriculum. And, while I am a fan of more sophisticated and consultative sales methodologies, I think that persistence in sales is still what separates the successful salespeople from the mediocre ones. Cold Calls to Appointments Ratio — In the interview, get a clear picture of phone activity at the beginning of the sales process. This is important to determine how many calls your prospective salesperson makes in order to get the important in-person or web demo. Find out how many times they call a prospect before they move on. If they only make two or three calls per prospect, you could be hiring someone who’s going to blow through lots of valuable leads to get his sales results. Length of the Sales Cycle — Ask your candidate to give you an example of the shortest time, and the longest time, it’s taken him to make a sale. Get an idea of the activity in between first call and wrapping up the deal. If it’s a large deal and a long sales cycle, watch for indications of how persistent your candidate was in the situation. Ask for an Example of Persistence — That’s right — just ask! Tell your candidate that persistence is a virtue you look for in a salesperson and ask him for an example where his persistence paid off. If he has to think longer than two seconds, he may not have a good example. Watch What He Does During the Hiring Process — Good candidates know that finding a new job has the same dynamics as making a sale. Good candidates ask what the next step is and get one. They follow up. They are persistent. Watch for this persistence in your own dealings with them. If they call you a day or two after the interview, that’s a good sign. If you tell him you’ll get back to him in a timely manner and you don’t, he should be almost hounding you for a next step. This entry was posted in Finding Great Employees/Recruiting, Additional Topics. Bookmark the permalink.